The Tomberg Family Philanthropies is pleased to announce our 2018 grants. In late February, our Advisory Board held its annual funding meeting in Palo Alto, California. The grants recommended by the Advisory Board and listed below were then approved by the Tomberg Family Board. We are happy to be able to support a number of truly excellent projects and organizations working to improve the world in our four primary funding areas of poverty alleviation, the environment, health and education. We would like to congratulate the following organizations on their successful grant requests. We would like to invite you to help support these organizations by donating along with us or helping in other ways. Click the like below for more details about these organizations and information on how you can help. Here are our 2018 grantees. City Blossoms is a grassroots nonprofit whose mission is to develop and implement innovative programming and tools that build healthy neighborhoods schools through creative, kid-driven green spaces to make safe, healthy, green space accessible to all Washington, DC residents, regardless of income. Coastside Land Trust is a 501(c)(3) nonprofit organization dedicated to the preservation, protection and enhancement of the open space environment, including the natural, scenic, recreational, cultural, historical and agricultural resources of Half Moon Bay and the San Mateo County coast for present and future generations. ForKids, Inc. is a 501(c)(3) nonprofit headquartered in Norfolk, Virginia, committed to breaking the cycle of homelessness and poverty for families and children. ForKids provides shelter, housing, education, and support services to families and children experiencing homelessness. The Greater Farallones Association (GFA) is the non-profit partner of the Greater Farallones National Marine Sanctuary. Its mission is to ensure the Sanctuary remains an ecologically diverse and globally significant ocean environment. GFA’s vision is to sustain a healthy and resilient ocean through education, science, and community involvement for the benefit of present and future generations. The mission of the Lookout Mountain Conservancy is to protect Lookout Mountain’s scenic, historic and ecological resources through conservation, advocacy, recreation and education, for current and future generations. From Hamilton County, Tennessee to Etowah County, Alabama, Lookout Mountain Conservancy works to protect significant scenic, historic and ecological sites by connecting existing conservation areas. “Leading the fight to end hunger in Marion and Polk counties, because no one should be hungry,” Marion-Polk Food Share (MPFS) is one of the largest of 20 regional food banks in Oregon. MPFS collects and distributes more than 8 million pounds of emergency food annually through a network of more than 100 hunger-relief partner programs, as well as providing self-sufficiency programs including Community Gardens, Nutrition Education, Workforce Development, Youth Farm and Community Food System Projects. Pro Mujer (PM) is a leading women’s development organization in Latin America with a mission to empower underserved women to realize their full potential. Pro Mujer is committed to providing women with access to the vital resources needed to start or improve businesses, increase their income and improve access to basic health services. PM operates 116 centers throughout Bolivia, Nicaragua, Mexico, Argentina, and Peru, with headquarters in New York City. Rainforest Partnership is an international non-profit social enterprise focused on protecting tropical rainforests. We partner with communities in Latin America to develop sustainable economic alternatives to deforestation, making it more valuable for them to keep their forests standing. By creating a global network—linking people to people, community to community—we act as a catalyst to create long-term economic and environmental sustainability. Reach Out and Read is a medically-based early literacy intervention, nationally recognized in the American Academy of Pediatrics endorsement of early literacy promotion in regular pediatric care. ROR Carolinas (RORC) is the regional coalition supporting the now 400+ clinical programs across North and South Carolina, whose mission is to provide a medically based literacy intervention for all children birth to 5 years of age, beginning with families living in poverty. Texas Lawyers for Children (“TLC”), the Child Protection Connection of Texas, is a 501(c)(3) organization whose mission is to improve case outcomes for abused and neglected children by enhancing the quality of legal services they receive, by raising public awareness, and by facilitating improvement in systems that serve children and families. Established in 1966 by a group of visionary volunteers who believed it was possible to live in a community where the health care needs of all were met, the West Yavapai Guidance Clinic (WYGC) has offered high-quality, client-centered mental health, crisis intervention, and addiction services to residents of Yavapai County, Arizona for over 50 years. The West Yavapai Guidance Clinic Foundation (WYGC Foundation) was established to support and enhance WYGC programs through fundraising and community awareness efforts. We would also like to thank all of the organizations that participated in this funding round by submitting Letters of Inquiry and / or full grant requests. This year we were able to make grants to approximately 9% of the organizations that applied for our assistance. To those organizations that we were unable to help this year, our decision not to offer support should not be considered an opinion on the merits of your project. We wish you success in obtaining funding from other sources, and hope that you will be successful in your endeavors. 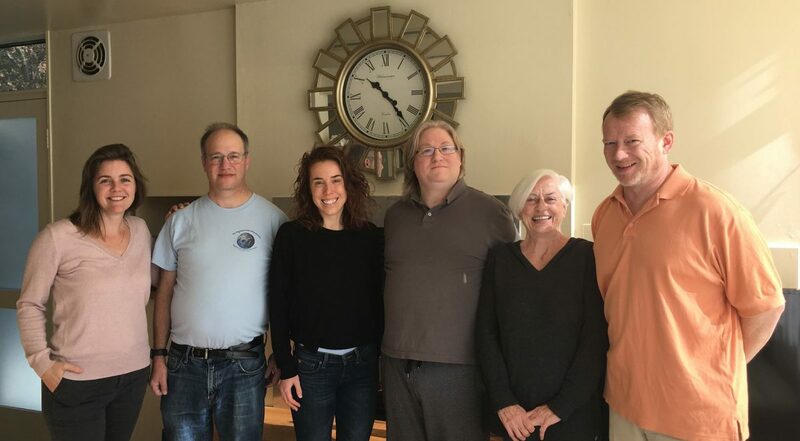 The Advisory Board members pictured in the above photo from left to right are Jennifer Yore, Charlie Tomberg, Carolyn Woolf, Gordon Landis, Hazel Barbour and Dave Lyon.